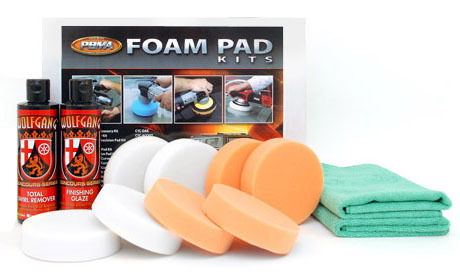 The ultimate swirl remover kit for the Cyclo! 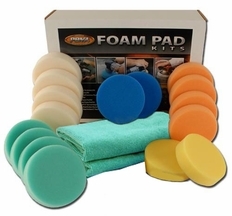 The Wolfgang Starter Kit for Cyclo Polishers combines the outstanding swirl-removing capabilities of Wolfgang polishes with high quality 4 inch pads that are perfectly sized for the Cyclo Model 5 or 5-Pro polisher. If you already have a Cyclo, this kit simplifies your search for high performance polishes and accessories. Wolfgang's Total Swirl Remover and Finishing Glaze are a 1-2 punch to swirls. Use the Wolfgang Starter Kit for Cyclo Polishers on all types of paint with excellent results. Wolfgang Total Swirl Remover 3.0 is a hybrid of our original Total Swirl Remover formula and Menzerna’s fast-cutting polish for ceramic clear coats. It combines Wolfgang’s diminishing abrasive technology with Menzerna’s special milling process, which produces consistently sized, fast cutting abrasives. 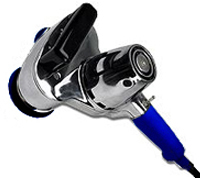 Wolfgang Total Swirl Remover 3.0 is an aggressive swirl remover with the gentle touch of a shine-enhancing polish. It’s not an oxymoron – it’s a unique breed of abrasives that level paint without scratching. Wolfgang Total Swirl Remover 3.0 starts improving the paint immediately and leaves the paint noticeably smoother and shinier, even before the finishing polish is applied. The Wolfgang Starter Kit for Cyclo Polishers works with either the original Cyclo Orbital Polisher (model 5) or the Cyclo 5-Pro Polisher with variable speeds. Polishers are sold separately. A total retail value of $98.92. Save $23.93! Don't have a Cyclo? Get the entire package in the Cyclo PRO Wolfgang Starter Kit.